For many companies, their greatest asset (and expense) is their people. With that in mind, leaders should strive to develop a working environment that is safe, engaging and cohesive. A huge impediment to this goal and one that we are hearing about more and more is workplace bullying and incivility. As employee populations become increasingly diverse and open, the opportunity for conflict is greater. On its own, conflict isn’t a bad thing. The best teams are often those that challenge each other in a constructive manner, and this can lead to breakthroughs, healthy competition, and fresh ideas. However, when the civility of that conflict isn’t prioritized, dangerous behaviors may ensue. While the conflict between employees has always existed, today’s political environment seems to flare divisive rhetoric and emotional responses to the extent that arguments have become more commonplace. As we become more accustomed to hearing these aggressive conversations outside of work, sometimes it is mistaken that they have become appropriate even within the office environment. This is where education is necessary. We need to teach our employees that no matter how common this rhetoric has become, it will not be condoned in the workplace. It is our role as leaders and professionals to prepare our managers for how to respond in the event that tempers flare. The Workplace Bullying Institute’s 2014 Nationwide Survey reveals some stunning information that can have a significant effect on the workplace. Imagine if 3 out of 5 of your employees left your company because of the circumstances surrounding bullying. Is your company prepared to respond to that amount of turnover? How much would all of the lost productivity cost? What about the missed opportunity costs? The impact on employee morale may be the most devastating, as it directly impacts productivity and your bottom line. 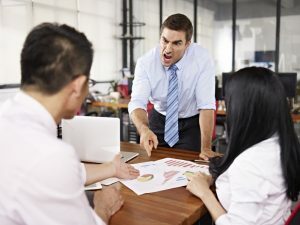 Whether or not you witness these behaviors in your own organization, an open conversation on the topic should be held with your leadership team and employees. You can stay ahead of the curve by implementing a professional behavior policy or incorporate incivility and bullying training into your onboarding process. We should all want our offices to be a safe space where your employees can thrive, because when they thrive, so does your company. The bottom line is that employees who feel engaged and supported will contribute to the success of the business.